Offensive Player of the Year: Daelenn Tokunaga, Pearl City, forward, So. There was no sophomore slump for Daelenn Tokunaga. In fact, it was quite the opposite. The Pearl City sophomore forward excelled in her second varsity season, helping the Chargers to their first state crown since 1997 and the fifth in school history. Tokunaga scored 26 goals on the year — second only to her own teammate, freshman Sunshine Fontes. "Individually they were great, but collectively they can be so dangerous," Mililani coach Ray Akiona said of the prolific duo. "They have similar styles, they're both quick and make good runs. If you try to mark up one too much, the other will burn you. They really make a great duo." Tokunaga scored at least one goal in 13 of Pearl City's 17 games this year. She had seven games with multiple goals, including a season-high four against Waianae to open the year. In the Chargers' first six games, Tokunaga netted 17 goals. Last year, to be quite honest, I didn't really think she was on the scene too much, (but) I think definitely her playing with Sunshine up top was just a really potent combination," Kapolei coach Brian Beck said. "With those two Pearl City could get the ball up top to either one of them and score. They scored an insane amount of goals this year. They were calm on the ball and almost unstoppable to a point." Tokunaga scored a goal in three of Pearl City's state tournament games. In the championship final she assisted on one goal and scored another and was eventually named the tournament's most outstanding player. "This year she had a lot more confidence," Akiona said. "She made really good-timed, aggressive runs on the attack. She committed really hard and has exceptional speed and that's what makes her dangerous. She's real smart about how to get open real quick against defenses." 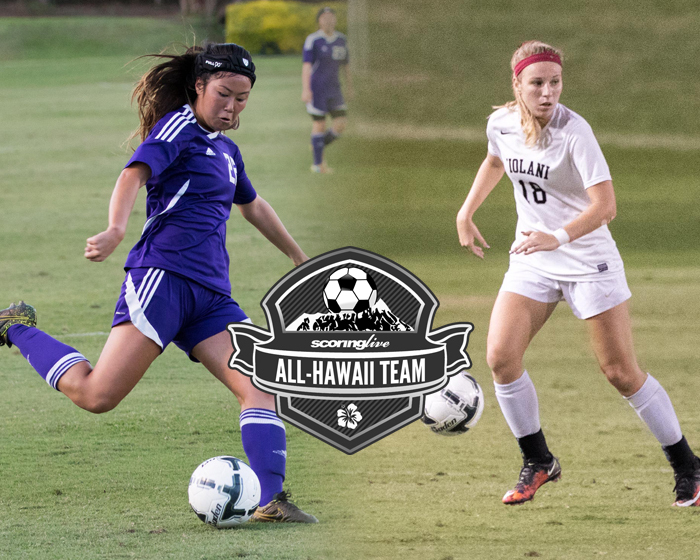 Tokunaga, who gave a verbal commitment to the University of Hawaii following her freshman season, was also named Oahu Interscholastic Association Western Division Player of the Year earlier this month. Defensive Player of the Year: Rachel Bowler, Iolani, fullback, Sr.
Rachel Bowler did a little bit of everything for the Iolani girls soccer team this year. The senior fullback was the lynchpin for the Raiders, who finished second in the Interscholastic League of Honolulu and qualified for the Division I state tournament. Bowler not only orchestrated the back line, but played a large role on offense as well. "She's just super composed when she's on the ball," Kapolei coach Brian Beck said. "It was basically like she was almost the quarterback of that team. Every time the ball is on her foot, she would just get them started. She was great on the transition and really she's the first offensive player on the team for Iolani. She's super calm and absolutely nothing phases her." With Bowler firmly in command, Iolani posted an 10-0-2 mark in the ILH and 11-2-2 record overall. It allowed just five goals all season and had nine shutout victories. Bowler was certainly a busy body for the Raiders. She took most of their free kicks on set pieces as well as corner kicks and throw-ins. Bowler scored eight goals on the year — seven coming in the ILH season. She also had a goal in a quarterfinal win over Kamehameha-Maui in the state tournament. "The thing I like about Rachel is she assesses the field a lot," Mililani coach Ray Akiona said. "She doesn't just worry about her own position, but she assesses the field and aligns the whole defense. It's hard to have that whole perception of the defense. What makes her exception is she gives them a lot of chances on offense on transition." It is the second straight year that Bowler was named to the All-Hawaii First Team. She was selected to the Division I all-state tournament team and was later tabbed as ILH Defensive Player of the Year in a vote of league coaches. Bowler is signed to play at Seattle University next year. Youth can be a great asset. It can also serve as a big hindrance. Frank Baumholtz III, the longtime coach of the Pearl City girls' soccer team, channeled that youth into success this year. Led by All-Hawaii First Team selections Sunshine Fontes, Daelenn Tokunaga and Bree Fuller — all sophomores or younger — the Chargers stormed their way to the Division I state title for the first time in 19 seasons. It was the fifth state crown in school history and the first under Baumholtz III, who coached the Pearl City boys to a state championship in 1999. "I have a lot of respect for Frank," Mililani coach Ray Akiona said. "He's a very experienced coach, he's very organized and I have a lot of respect for him because he stresses team and discipline and responsibility. He focuses on the collective and makes the message pretty clear that individuals cannot play and win and that a team has to play collectively." The Chargers compiled a 16-1 overall record, including a 12-1 mark in the Oahu Interscholastic Association. They rebounded from their lone loss — a 2-1 defeat to Mililani in the league final — by winning four games in as many days en route to the state title. "I'm really happy for Frank to see that he won the state title," Kapolei coach Brian Beck said. "He's super deserving. He always advocates for the girls and makes sure they're taken care of. I know he loves his kids." As if the rigors of the OIA West weren't enough, Pearl City played all of its games on the road this year due to an ongoing resurfacing of its home field. "That's hard to do," Beck said. "Even moreso that's to his credit because they had to play on the road all the way up until the state final. I couldn't be more happy for him."